About a decade ago, the California Department of Transportation (Caltrans) initiated the California Toll Bridge Seismic Retrofit Program. The objectives are to determine the vulnerability of California's major toll bridges to damage associated with strong earthquakes and to design retrofits to improve seismic safety. ADINA is used abundantly by Caltrans and contractors in this Retrofit Program. 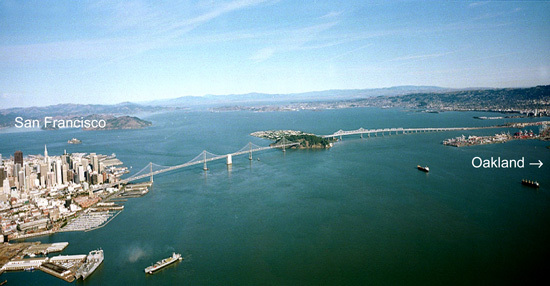 A very important part in the bridge analyses is the modeling of the braces in the bridge structures (a photograph of the San Francisco-Oakland Bay Bridge is shown below). Typical braces, which are laced built up members with rivets, were tested in the laboratory. Since there are many such braces in bridge structures, it was necessary to establish a simple and effective finite element model of a typical brace. In the following we briefly describe, courtesy of SC Solutions, California, the modeling and verification of the behavior of these braces using the ADINA moment-curvature beam elements. This ADINA capability has proven to be of major importance for the nonlinear analyses of bridges. For the verification study, braces subjected to axial and flexural stresses were modeled in detail with shell elements and, simplified, with the moment-curvature beam elements in ADINA. The following figures show that a drastic reduction in degrees of freedom (from about 15,000 dofs to about 50 dofs) to represent a brace is possible by employing the moment-curvature beam element models, without losing any practical accuracy in the results. Therefore, the computation time is drastically reduced by the use of the simplified beam model for a brace while maintaining sufficient accuracy. Also, axial force-displacement hysteresis loops that were obtained from the experiment were compared with the numerical results obtained using the moment-curvature beam elements, as shown in the following figure. The moment-curvature beam elements provided a good correlation with experiment. These conclusions were reached for various brace slenderness ratios and thus the moment-curvature beam elements were qualified to be a very important capability in ADINA for modeling braces in large bridge structures.